How does clean water fit into your morning routine? In Ethiopia, morning routines include walking long distances and collecting clean water for use and consumption. For one family overcoming the Ethiopia water crisis, each clean drop of water is utilized with gratitude and celebration. Bensa, Ethiopia is dense with vegetation and when it rains, it pours every afternoon. The rainy season makes the roads muddy and impassable even for the most well-equipped vehicles. In the village of Keramo in the Hayisa Oloncho sub-county, girls gather in the morning mist to make their journey to the clean water source, on foot. Their typical morning walk takes them through neighbors’ compounds and down a muddy road, where they eventually arrive at the river. They scurry over three logs to reach the water source. After filling jerry cans and bottles with water, they turn around and hurry home. Aster washing her hands with the family tippy tap. Back at Keramo, a family goes about their morning routine. Aster and Tamire, a young married couple, are caring for their five children and tending to their home and farm. 27-year-old wife and mother, Aster cooks food and roasts the family’s home-grown coffee. 35-year-old husband and father, Tamire, tends to the farm. He grows around 2,000 kilos of coffee on the family farm, as well as a plant called False Banana. This plant looks like a banana tree but does not produce fruit. Instead, parts of its trunk are harvested and ground up into a semi-flour to be mixed with butter and cooked. 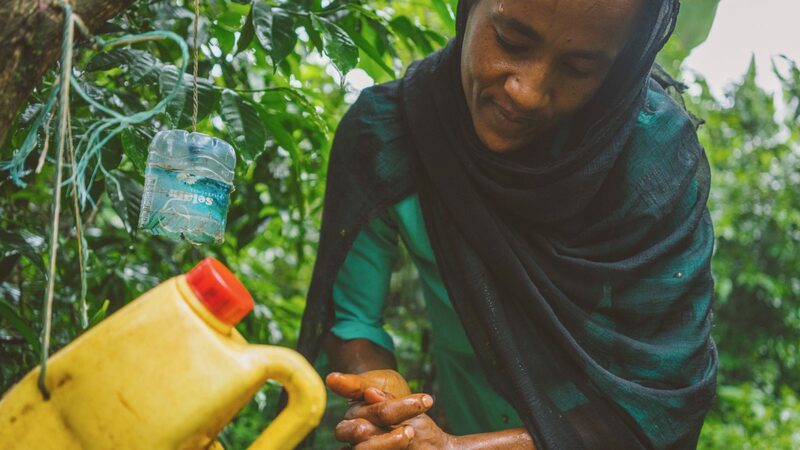 Once the girls return with the water they collected, the family begins washing their hands and preparing to eat breakfast, knowing that every drop of water consumed or used for washing, is precious. Not long ago, Aster and Tamire began to make changes in their home and behaviors so the family would become healthy. They had experienced chronic diarrhea with their children and would frequently find themselves at the health center, using the little money thay had on medicine. When they were introduced to WASH (Water, Sanitation, and Hygiene) habits, they worked hard to improve their environment. They built a latrine in their compound that provides the family with a clean, safe place to use the bathroom. Next to the latrine, they built a handwashing device called a tippy-tap, to care for their hygiene. Outside their home, they built a drying rack to keep dishes sanitary after being washed. Most importantly, the entire family is now using and drinking clean water. Aster and Tamire now know the value of clean water. Through their hard work and dedication, they have given their children the chance to live fuller, healthier lives. Thanks to you, this family, as well as other families in Ethiopia, have access to clean water, and improved sanitation and hygiene.